Mark Pesce at CUA09 - Think Like a Cloud, Make a Storm, Kill the Tower! I was going to participate remotely via hologram as Doug Jacquier describes skype for a roundtable with Mark, but my crazy schedule, time zone dyslexia and not realizing that I would actually be on a Virgin Flight with Wifi .. oh well. The audio is fading a bit, so I've been thinking about what Mark wrote in his essay, "Sharing Power (Aussie Rules)" I read the essay three times, I mind mapped it, and have been noodling on it for an hour or two. Here are the bits that resonated with me. He talks about the "Cloud" a word to describe how we're all more closely connected through social networks like Twitter, Facebook, and etc. And how our connectedness is resulting in new collective behavior that can't be controlled. The same sort of engine which powers Wikipedia can be put to work across a number of different “platforms”. The power of sharing allows individuals to come together in great “clouds” of activity, and allows them to focus their activity around a single task. It could be an encyclopedia, or it could be providing reliable and judgment-free information about sexuality to teenagers. The form matters not at all: what matters is that it’s happening, all around us, everywhere throughout the world. The boundary between work and personal time is virtually non-existent. If you want to dive into more details into this condition, see the hyper connectivity blog. Pesce points out that this condition leads to observational learning from watching other people's behaviors online. Something he terms hypermimesis (which if you google can mean morning sickness) but means that these behaviors can be replicated quickly. He also defines it as the formation of communities of interest can form around particular behaviors, or "clouds" potential. He goes to list some examples and asks "How many examples do we need to name before we admit that the rules have changed, that the smooth functioning of power has been terrifically interrupted by these other forces, now powers in their own right?" The entire nature of power has changed, as have the burdens of power. Power has always carried with it the ‘burden of omniscience’ – that is, those at the top of the hierarchy have to possess a complete knowledge of everything of importance happening everywhere under their control. Where they lose grasp of that knowledge, that’s the space where coups, palace revolutions and popular revolts take place. He describes the power shift that the cloud presents and it's burden of "always on." This new power that flows from the cloud of hyperconnectivity carries a different burden, the ‘burden of connection’. In order to maintain the cloud, and our presence within it, we are beholden to it. We must maintain each of the social relationships, each of the informational relationships, each of the knowledge relationships and each of the mimetic relationships within the cloud. Without that constant activity, the cloud dissipates, evaporating into nothing at all. While we might desire to extend our power and capabilities through our networks of hyperconnections, the cost associated with such investments is very high. Time spent invested in a far-flung cloud is time that lost on networks closer to home. Yet individuals will nonetheless often dedicate themselves to some cause greater than themselves, despite the high price paid, drawn to some higher ideal. I think this is connected to what Rheingold's Attention Literacy piece, but I have go back and read it again. He discusses the high price of hyperconnectivity for individuals AND for organizations. For each of us, connectivity carries a high price. For every organization which attempts to harness hyperconnectivity, the price is even higher. With very few exceptions, organizations are structured along hierarchical lines. Power flows from bottom to the top. Not only does this create the ‘burden of omniscience’ at the highest levels of the organization, it also fundamentally mismatches the flows of power in the cloud. When the hierarchy comes into contact with an energized cloud, the ‘discharge’ from the cloud to the hierarchy can completely overload the hierarchy. That’s the power of hyperconnectivity. In the 21st century we now have two oppositional methods of organization: the hierarchy and the cloud. Each of them carry with them their own costs and their own strengths. Neither has yet proven to be wholly better than the other. One could make an argument that both have their own roles into the future, and that we’ll be spending a lot of time learning which works best in a given situation. What we have already learned is that these organizational types are mostly incompatible: unless very specific steps are taken, the cloud overpowers the hierarchy, or the hierarchy dissipates the cloud. We need to think about the interfaces that can connect one to the other. That’s the area that all organizations – and very specifically, non-profit organizations – will be working through in the coming years. 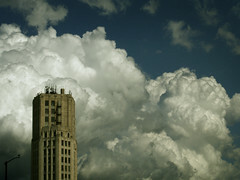 Learning how to harness the power of the cloud will mark the difference between a modest success and overwhelming one. Yet working with the cloud will present organizational challenges of an unprecedented order. There is no way that any hierarchy can work with a cloud without becoming fundamentally changed by the experience. The last section of the essay talks about the cloud, tower, and storm, elegantly pushing the metaphors. All organizations are now confronted with two utterly divergent methodologies for organizing their activities: the tower and the cloud. The tower seeks to organize everything in hierarchies, control information flows, and keep the power heading from bottom to top. The cloud isn’t formally organized, pools its information resources, and has no center of power. Despite all of its obvious weaknesses, the cloud can still transform itself into a formidable power, capable of overwhelming the tower. To push the metaphor a little further, the cloud can become a storm. He also points out a pattern of how storms get started. In other words, five people have to take the lead, leading everyone else in the cloud with their dedication, their selflessness, and their openness. This number probably holds true in a cloud of any sort – find five like-minded individuals, and the transformation from cloud to storm will begin. He also describes how the storm grows in intensity - similar to what we have observed with participation in online communities over time, but more powerful perhaps because of the networked effect. At the end of that transformation there is still no hierarchy. There are, instead, concentric circles of involvement. At the innermost, those five or more incredibly dedicated individuals; then a larger circle of a greater number, who work with that inner five as time and opportunity allow; and so on, outward, at decreasing levels of involvement. What, then, is leadership in the cloud? It is not like leadership in the tower. It is not a position wrought from power, but authority in its other, and more primary meaning, ‘to be the master of’. Authority in the cloud is drawn from dedication, or, to use rather more precise language, love. Love is what holds the cloud together. People are attracted to the cloud because they are in love with the aim of the cloud. The cloud truly is an affair of the heart, and these affairs of the heart will be the engines that drive 21st century business, politics and community. This reminds of something that Nancy White was writing about a while back about community indicators and the Beatles song, "All You Need Is Love." I think it was 2006 when the entire room of 1400 bloggers burst into spontaneous singing of this song at BlogHer. I couldn't find it, but did find a connection through her writing about slow community which is very un storm and cloud like. He ends with a call to action to organizations about understanding, working with, and leveraging the cloud. All of you have your own hierarchical organizations – because that’s how organizations have always been run. Yet each of you are surrounded by your own clouds: community organizations (both in the real world and online), bulletin boards, blogs, and all of the other Web2.0 supports for the sharing of connectivity, information, knowledge and power. You are already halfway invested in the cloud, whether or not you realize it. And that’s also true for people you serve, your customers and clients. His advice: (1) Embrace the cloud - it isn't evil. Don't be scared of it. (2) Work like the cloud within your organization. I think he's talk about culture change. (3) The Cloud is evolving and changing pretty quickly. Mark is keynoting the Personal Democracy Forum this year in NY in June and this is the theme of what he is talking about. I wish I could go, but the moving van is arriving that day. My friend, Mark, always amazes me with his ability to communicate this stuff. He obviously has a lot more time to consider his words in his public speaking than I.
I'm still only halfway through the essay. Any chance of a copy of that mindmap? Beth, I think you may have hit on one of the most important shifts re "quality of leadership of a cloud or networked leadership" ... over as ASAE we in assn are talking (though not nearly as seriously as we should) about the changing role of volunteers. The Decision to Volunteer study told us a lot about association volunteers - who are different in some important ways and very similar in key ways to c3 community volunteers - but mostly urged us to rethink the paradigm. And I think this phrase "networked leadership" could help better understand that paradigm. Brilliant metaphors, message, and post. Extremely helpful as I head into a discussion today, helping a consulting group understand just how to help their nonprofit clients navigate the social media environment. It *is* about finding points of connection between the hierarchy of the organization and the "hierarchy-less-ness" of a cloud aka community aka everyone-who-shares-the-organization's-commitment-to-a-certain-mission. Thank you, Beth. Stephen, the mindmap is not electronic, did it on paper. I'll try to crank out a visio or ppt diagram and upload onto flickr. I think that the concept of wirearchy is between the hierarchy and the cloud and is very much aligned with what many non-profits strive to be. One problem with NP's is that they took their governance structures from for-profit corporations and these are obviously not optimal for the type of work they do. Hi Beth, and thanks so much for this post. It hits on a deep thread about culture change and leadership change, which I think we're seeing in working relationships all over the place. I know that I have been frustrated, and have interpreted an unwillingness to collaborate and iterate; and your thoughts here help me understand that I'm working in a cloud, when others may be in the tower. Thanks much - this is great food for thought. Thanks Beth, this is great! I'm intrigued by this because I was frustrated by hierarchies in organisations as a professional. I think it is scary to management because it comes to real leadership, and not management power through your position.. It's an intriguing metaphor - an alternate reading is the capacity of a storm to electrify or charge a (T)ower with all the force and energy of a storm - hierarchies can also be perfectly useful models of activity as well as rather less useful models of authority. Concentric circles of involvement (call it organizational citizenship behaviour) is still a hierarchy by any other name...I've no great love for hierarchies or the predictable patterns of behaviour certain hierarchies engender but the metaphor does rather deconstruct itself (as is the habit of metaphors) into its ostensible opposite. And further to Peggy Hoffman's comment. Beth your thoughts raise the question of leadership and "power" and the dynamics of this in the cloud. The phenomenon of group polarisation via the cloud (sorry Aussie spelling)is extremely interesting and for me raises the question of the power balance between the amplification of the 5 or so instigators or drivers and the other larger group of followers / supporters. I think the cloud formation is also fascinating to identify the issues that particular groups are really passionate about - as you say Beth issues or groups inspired by the heart. I wonder if there has been any mapping / tracking of emerging clouds and what the issues/ common interests have been at the heart of these, stimulating the initial formation? Particularly those that have turned into storms rapidly? Beth, thanks for the link to his fascinating essay and your summary/thoughts. He makes very eloquent use of the "cloud" and "tower" metaphors, and like you I find myself wondering about the bridge between them. If a "cloud" is a group of independently acting individuals who are motivated by the love of a cause, that sounds like a fundamentally different type of group than a formal hierarchy with explicitly divided power. But I think he's describing the Platonic ideals at the ends of a spectrum rather than a binary choice. Many towers exist to organize the work of a group that is motivated by heartfelt desire to accomplish a common goal, and many clouds will form towers, even if only implicitly, in order to accomplish a goal that requires leadership. I wonder if the answer to your question might be, at the deepest level, that in a world full of clouds the person at the top of the tower needs to learn how to lead the lower floors for love as much as money.